Although I love to cook the electric gadgets in my kitchen are pretty thin on the ground. There’s the obvious kettle and toaster as well as my ‘can’t live without’ stick blender….but that’s about it. I don’t even own a microwave let alone a slow cooker. In our last apartment we installed a fancy Miele warming drawer and a steam oven – both of which were rarely used. Funnily enough I steam much more often now using my Aldi $10 steel steaming basket…. Given this I did need more than a little convincing by my husband on a recent new kitchen gadget – especially because it’s not small enough to tuck away out of sight. What is it? A a dehydrating machine. It’s about the size of a microwave and contains a heating element, a fan and vents that work to remove moisture. You can pick one up online for as little as $100. Our main intended use for the dehydrating machine was making homemade yoghurt and activating nuts…..but as you can see here it’s much more useful than I expected. 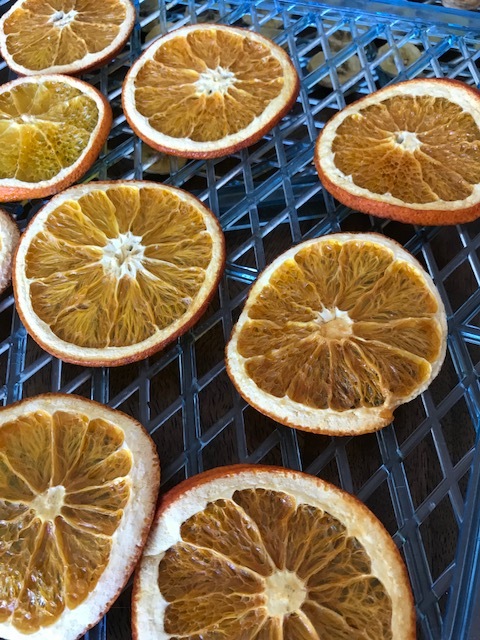 Here I’m sharing my husband’s method for preparing dehydrated fruit. Essentially dried or dehydrated fruit is fruit that’s had the water or moisture removed. The best thing is you don’t need a dehydrator – you can achieve great results using the oven. 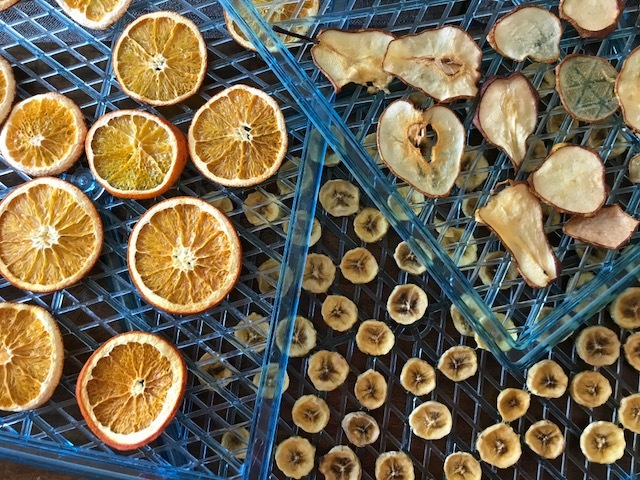 Dehydrating is a fantastic way to preserve surplus fruit for extended periods at room temperature. The method I’m sharing here has been tried and tested on bananas, oranges, pears and apples – all of which are a simple start point for your first dried fruit experiment. Prepare your acidulated water* in a large bowl – add 1 tbsp of vinegar or lemon juice into 1 litre of water. Finely slice your chosen fruit – the finer the better if you can to create a crispy end result. As you slice the fruit add it to the bowl of aicdulated water (this stops the fruit from browning in appearance). Once all of the fruit is sliced drain it thoroughly (it’s optional to use a paper towel to remove extra moisture). Carefully arrange the fruit on your dehydrator trays – or oven proof trays if you’re using the oven. Be sure to spread them spaciously without overlapping individual pieces. Dry the fruit at 55C to 60C for 8-12 hours or until the fruit is firm, dry and crispy. If there are any moist pieces then they’ll need a little longer. Dry the fruit in the oven at 50-60C (this is likely to be the lowest temperature you can set the oven too). Cook (or dry) for 8-12 hours. The ideal time will really depend on your oven. If your oven has ‘hot’ spots then consider rotating the oven trays during the cooking time. With both methods cool the fruit at room temperature for 15-20 minutes. Check the fruit for any remaining moisture and if any pieces seem moist then continue drying or put them aside for immediate feasting. Finally transfer to sterilised glass jars – where the fruit should preserve well for 6-12 months. *Acidulated water is water where an acid is added to prevent cut fruits or vegetables from going brown. Tags: dehydrate, dehydrator, dried, fruit, how to, in oven. Bookmark the permalink. I use the oven to dry tomatoes, but it’s really great to know this method works with fruits as well. Hope to try it soon. Thanks Ronit and great tip on the tomatoes – I’ll have to try that too! We use sun-dried mangoes in our cuisine. Since it is a time-consuming process, now I can try your method using oven. Thanks for the wonderful share. I have a dehydrator and love it. I have a post coming up describing what I do with excess tomatoes and jalapenos! For some reason I’ve never dried fruit – maybe because they don’t grow in my garden? I’ll look forwards to reading how you use your dehydrator Chef Mimi – I usually have an excess of tomatoes too! That’s a fantastic idea – I’d love to know what you use them in also! Thanks for sharing the oven method, as I am not a fan of single use kitchen gadgets. I’m going to try this as an overnight experiment just for the fun of waking up to the aroma of warm fruit in my house! Glad you like the post Marian and let me know how your experiment goes – totally with you on the single use kitchen gadgets too! I agree about those gadgets Laura. The air fryer has been tempting me but it is quite bulky. I have never dried fruit but now you have inspired me to try it with this post! I like the flavor of dried fruit a lot. Hi Sandhya – I’ve never heard of an air fryer – perhaps you don’t need to give into temptation! 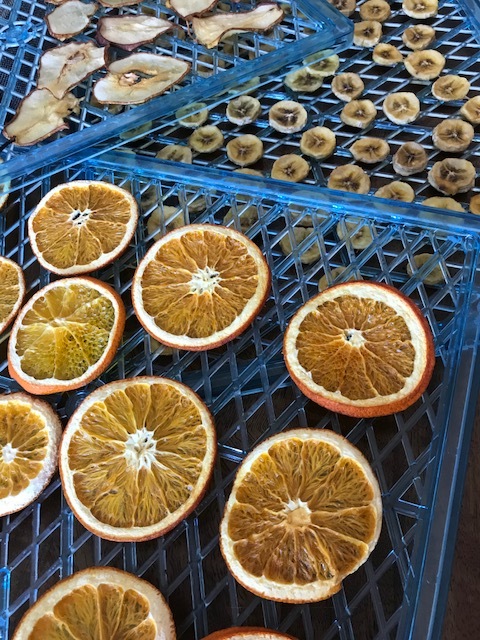 You must try drying fruit – it’s really easy even without a special machine! I’m like you Laura, I can’t live without my stick blender AND it takes a lot of convincing to get me to add another “gadget” to the kitchen…. but you’ve at least got me reconsidering a dehydrator. If only you could see the bundles of herbs hanging in the kitchen at the moment. So funny that we’re on the same page – and glued to our stick blenders! You really should consider a dehydrator – for making yoghurt, drying fruit and yes drying herbs too!! Oh! I didn’t know it could make yogurt too! Must look into this. Thank you so much for such a great informative post! !